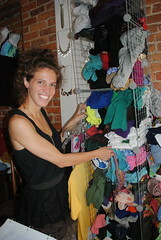 Rhea Mahbubani Kate Goldwater specializes in using discarded or secondhand items to craft new fashions. In a neighborhood that is chock-full of chic boutiques, Kate Goldwater is doing her best to stand out. Ms. Goldwater, 26, a self-proclaimed “social justice crusader” designs an environmentally-friendly clothing line for AuH2O, her East Village boutique. All her designs are made from recycled items. Ms. Goldwater gets discarded or secondhand clothing wherever she can ̶ including the Salvation Army, Goodwill, clothing swaps – and transforms them into one-of-a-kind pieces. Ms. Goldwater has been running AuH2O (the chemical symbols for Gold and Water) since October 2006, but last month she took on three business partners; Rachael Rush and Alexandra Sinderbrand, who sell vintage and thrift store clothing, and Rose Kennedy, a jewelry designer who creates trinkets from salvaged items. Now all four women sell their gently-used finds and original designs in the boutique and split the monthly rent. In the past Ms. Goldwater received attention for creating unconventional clothing, including a tie made from credit cards and a dress made from MetroCards, which earned her a cease-and-desist email from an MTA lawyer. However she has recently turned her attention to more wearable clothing saying, “I want to make recycled clothes that people wear for a long time. People thought of the unusual designs as novelty items that they wore once. That isn’t so eco-friendly.” She also produces tailor-made items for customers by updating clothing that they no longer wear. Kate Goldwater Before: A pile of men’s ties. Kate Goldwater After: Safia Karasick Southey, 12, in the vest she plans to wear for her Bat Mitzvah. Kate Goldwater Before: A fraying tank top from a thrift store. 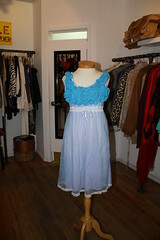 Kate Goldwater Before: A sheer, blue nightgown. Sally Lauckner After: A lingerie-inspired dress. Kate Goldwater Before: A brown cardigan that was a hand-me-down from Ms. Goldwater’s friend. 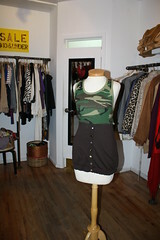 Sally Lauckner After: An army print tunic.